Each blue tarp represents a roof that needs repair or replacement. The Caribbean island of Puerto Rico, which means ‘Rich Port’, is a U.S. territory and its people are U.S. citizens. Puerto Rico is rich with history, diversity, and is a beautiful island. Even in the face of devastation those things are still true. 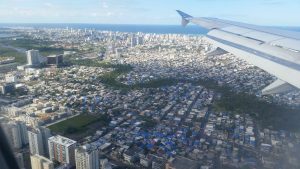 In September of 2017, Puerto Rico was hit by Hurricane Irma followed by Hurricane Maria. Either one of those hurricanes was enough to cause significant damage, but paired together they devastated the island. Our initial focus is going to be repairing and rebuilding damaged homes on the southeast corner of the island where the storm slammed ashore. It is a rural area far from the capital that certainly was not wealthy even before the storm. 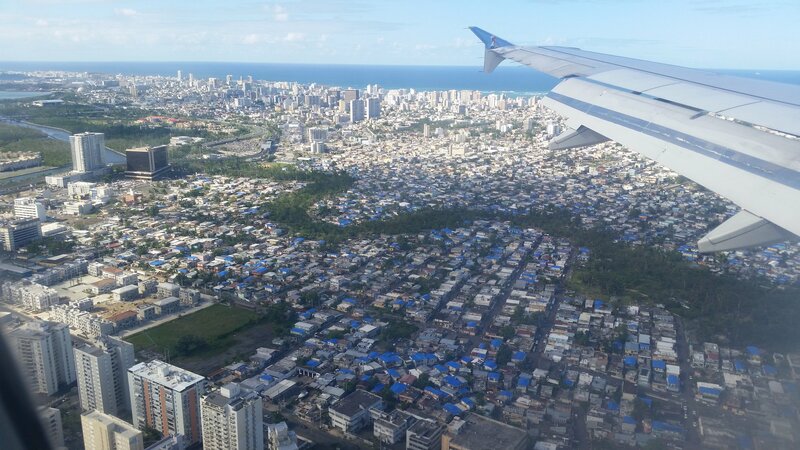 Many families are living with blue tarps as roofs and are being affected by unsanitary and unsafe living conditions because of the damage to their homes. But we can help change that! Getting involved – There are several ways that you can get involved: donate to support this specific partner, volunteer on one of our Puerto Rico Global Builders teams, which you can learn more about below, or join a trip as a virtual volunteer, choosing to donate your travel costs instead of making the trip. We make virtual volunteering fun — see virtual volunteering explained here! Our first teams to Puerto Rico will be helping repair and rebuild homes near the town of Maunabo, which has a population of about 15,000 people. 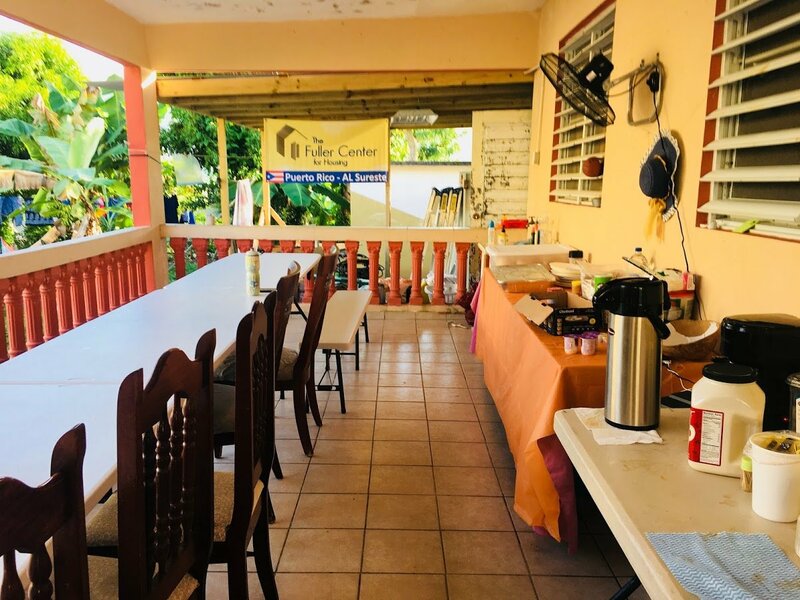 Maunabo is surrounded by beautiful beaches of blue and green water on one side, and high mountains on the other that keep it secluded from the rest of the island. Our volunteers will stay and often work in a rural community on its outskirts called Calzada, which has 184 families, plus another 96 families in the surrounding area. 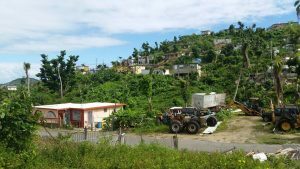 These are families in one of the hardest hit areas of the island and are still in the midst of the long recovery process. 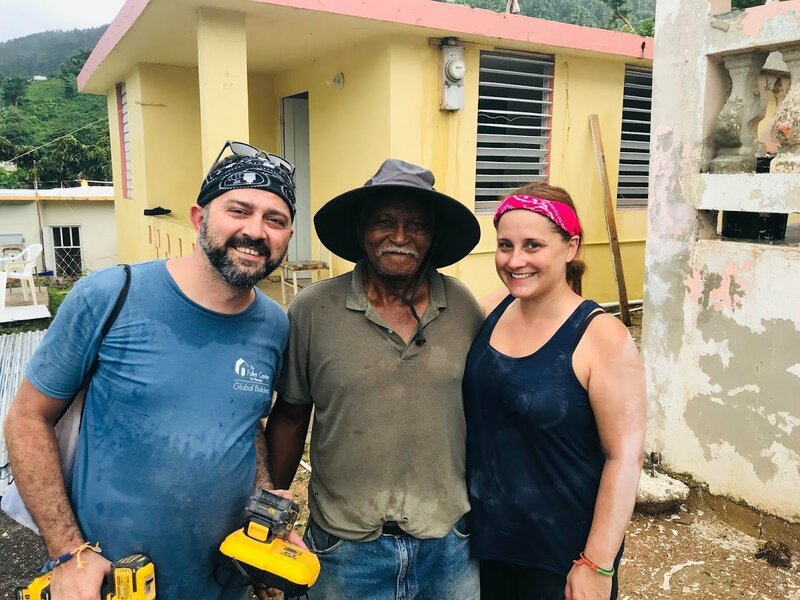 Each trip to Puerto Rico will be with a group of mission-minded volunteers — typically 8-20 total — who want to experience the world, meet new people, and make a difference. No skills required. All trips will begin on Sunday and last 1 or 2 weeks, which will include time to take in the island’s beauty. Since Puerto Rico is a U.S. territory, no visas or passports are needed for U.S. citizens traveling from the U.S. and its currency is the U.S. dollar. Please note that since Puerto Rico is a U.S. territory, we are currently not allowing anyone under the age of 16 to go in an effort to comply with OSHA regulations. 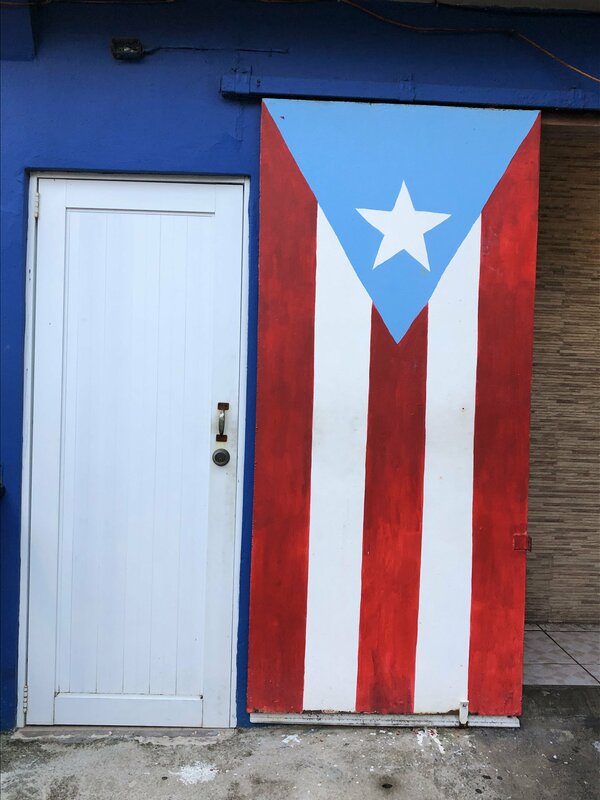 Due to the high interest in Puerto Rico, all trips will start on a Sunday and end on Saturday or Sunday, as determined by the schedule created by the trip leader. Trips may last either 1 or 2 weeks. The high number of teams also means that flight schedules have to follow a clearer plan as well. Teams need to arrive before 4:00 p.m. on the Sunday that starts their trip. There will be a single pick-up for the entire team, so coordinate your flight with your team leader to avoid long wait times. For departing Puerto Rico, you will be dropped off at the San Juan Airport at 10:00 a.m., so we do not recommend departure flights before noon. If we have teams back-to-back and the arriving team is coming in before 10:00 a.m., they will need to wait for the staff to get there at 10:00. We are focusing on making repairs to existing homes that have been badly damaged by the hurricane. That will mainly entail repairs to doors, windows, outside structure of homes, roofing, cement mixing, scraping, painting, and other jobs of that nature. We will provide necessary tools, but as with most build sites, it never hurts to bring a few small hand tools with you. Keep in mind that multiple teams often work on the same project, so be prepared to jump in at any point of the build: whether that’s at the start breaking down crumbling roofs or at the end putting on the last touches of paint. Teams eat their locally cooked meals in the center of town alongside local volunteers. Groups will be staying in homes generously lent for our use. Most volunteers will be sleeping on cots, but a lucky few will be able to use the beds available in one of the houses. There is a library/community center in town that can occasionally host larger teams and has WiFi. Food will be wonderfully prepared by locals in Calzada. For those wanting more upscale accommodations, there is a hotel about 20 minutes away in Maunabo. Lodging at the Parador MaunaCaribe is admittedly more expensive, but teams stay right on the beach and breakfast and dinner are provided by the hotel. Since the guest houses are right there in the community, some projects will be a walkable distance. If not, a van will be used to transport the group. The distance from the guest house to each work-site will vary, but it will not make for a long drive. All volunteers will be picked up and dropped off at the airport. With the beautiful scenery all around, finding something to do for R&R is not a hard thing to do. Trips outside of Maunabo or to places with entry fees will have extra costs that are normally passed along to the teams. Your team leader or the Fuller Center host will make these clear ahead of time. Your trip fee covers food, lodging, on-site transportation including airport pick-up and drop-off, emergency medical insurance, hat, t-shirt, and a donation toward the work. See table below for more details. As trips with openings become available, we post them at the top of this page. To apply to join their trip, simply click “Join” next to the trip of your choice. To request more information or be put in touch with the team leader, click the “Request more information” button at the top. If you’re an experienced traveler or team leader, or if you have a group of your own (church, school, etc. ), Propose a Trip to let us know what you might like to do!